Gap junctions (GJ) are one of the most common forms of intercellular communication. GJs are assembled from proteins that form channels connecting the cytoplasm of adjacent cells. They are considered to be the main or the only type of intercellular channels and the universal feature of all multicellular animals. Two unrelated protein families are currently considered to be involved in this function, namely, connexins and pannexins (pannexins/innexins). Pannexins were hypothesized to be the universal GJ proteins of multicellular animals, distinct from connexins that are characteristic of chordates only. Here we have revised this supposition by applying growing high throughput sequencing data from diverse metazoan species. Pannexins were found in Chordates, Ctenophores, Cnidarians, and in the most major groups of bilateral protostomes. Yet some metazoans appear to have neither connexins nor pannexins in their genomes. We detected no connexins or pannexins/innexins homologues in representatives of all five classes of echinoderms and their closest relatives hemichordates with available genomic sequences. Despite this, our intracellular recordings demonstrate direct electrical coupling between blastomeres at the 2-cell embryo of the echinoderm (starfish Asterias rubens). In these experiments, carboxyfluorescein fluorescent dye did not diffuse between electrically coupled cells. This excludes the possibility that the observed electrical coupling is mediated by incomplete cytoplasm separation during cleavage. Functional GJs are present in representatives of the clade that lack currently recognized GJ protein families. New undiscovered protein families utilized for intercellular channels are predicted. It is possible that the new type(s) of intercellular channels are present in parallel to pannexin and connexin gap junctions in animal groups, other than Echinodermata. Intercellular communication is the basis for coordinated function of multicellular organisms. Numerous types of molecules were shown to transfer biological signals from one cell to another. Typically, such molecules are released by a special mechanism from one cell and diffuse into the extracellular space to act on the neighboring or distant cells of the same multicellular organism. Another route of communication requires direct cellular contacts that may use signal molecules and their receptors, bound to membranes of the adjacent cells. The most intimate intercellular contacts occur by the direct linkage of the cytoplasm of two cells. In some cases, complete cell fusion may be similar to the multinucleated syncytia . Otherwise, distinct specialized channels called gap junctions (GJs) may link adjoining cells [2–4]. Intercellular channels in multicellular animals were first discovered as electrical synapses between neurons . Establishment of the electrical coupling between adjacent cells with the electrophysiological techniques shaped the basis of GJ studies [1, 5, 6]. 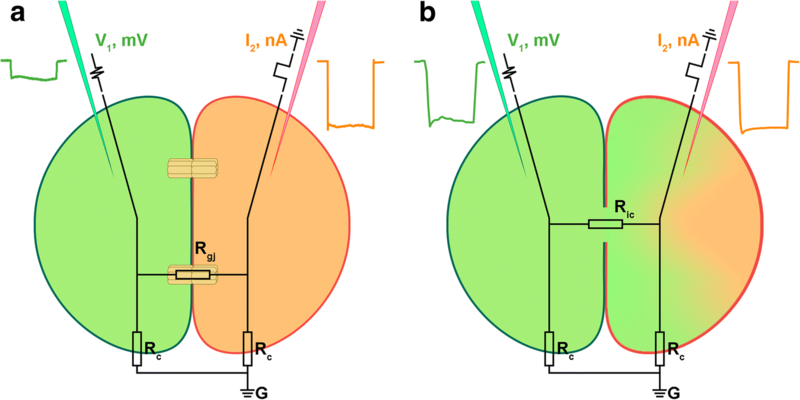 Later it was found that these channels are permeable not only to small ions but in some cases to bigger molecules including fluorescent tracer dyes that allow the detection of GJs and the estimation of channel size and properties [1, 6–8]. Fluorescent tracer dyes are also used to distinguish syncytium from proteinaceous GJ channels [6, 9, 10]. In the case of cells fused in syncytium or incompletely separated cells upon the cell division event even big hydrophilic molecules readily spread to the cytoplasm of all connected cells but are restricted to individual cells connected by GJ (Fig. 1). Connexins were identified as the molecular components of vertebrate GJ about 30 years ago . For a long time it was assumed that connexins were the only family of GJ proteins. As long as numerous attempts to clone connexins from invertebrates failed, it was finally suggested that invertebrate GJ are assembled from proteins unrelated to connexins . This protein family was found in studies that analyzed Drosophila and C. elegans mutants, and was originally designated OPUS for four founder protein family members: ogre, passover, unc-7 and shakingB [12–15]. Later they were renamed innexins, suggesting that they were specific invertebrate GJ proteins . Fifteen years ago, we found the presence of innexin homologues in humans and other vertebrates, and proposed to reclassify innexins and their vertebrate homologues into a bigger family, named pannexins [17–19]. In this paper, we will use the terms innexins, pannexins or innexins/pannexins as synonymous. Analysis of currently available massive high throughput sequencing genomic and transcriptomic data allows us to understand not only what genes are present in a given organism but also to pinpoint genes that are absent in the genome. The most intriguing outcome of such survey for GJ proteins was the absence of both GJ protein families in several species despite the general view, where GJ are universal in all animals. Previously we reported that sea urchins (Strongylocentrotus purpuratus) are devoid of both connexins and pannexins [9, 10, 20, 21]. The list of such species has now grown and includes Sponges, Trichoplax, Echinoderms, Tardigrades, Priapulids and several other animals (see results section). There are almost no publications on functional GJ studies on species lacking both connexins and pannexins. The only exceptions are three papers related to low electrical resistance cell junctions on two echinoderm species [22–24]. These studies were performed prior to pannexins discovery and sea urchin and other echinoderm genome sequencing. Additionally authors did not use tracer dyes [22, 23] or used dyes for which GJ were permeable making discrimination between cytoplasmic bridges and GJ channels complicated . In this paper, we first screened available diverse high throughput sequencing genomic and transcriptomic data from different metazoans for connexin and pannexin orthologs and found several groups of animals that lack both protein families in their genomes including twelve species of Echinoderms. Next, using electrophysiological techniques combined with intracellular dye injections, we demonstrated functional GJs in the Echinoderm Asterias rubens 2-cells embryo. Using HMMER (http://hmmer.org/) we searched for Innexin (PF00876) and Connexin (PF00029) PFAM domains from eukaryote databases at NCBI (https://www.ncbi.nlm.nih.gov/) and PFAM (https://pfam.xfam.org/). GJ proteins from different species were taken to perform systematical search via BLASTP and TBLASTN in individual organisms or big phylogenetic groups. For connexins 10 assorted query proteins were taken from tunicates and chordates and for innexins/pannexins 20 assorted query proteins were taken from ctenophores, cnidarians, arthropods, nematodes, mollusks and chordates (Fig. 2). Common starfish Asterias rubens were collected at The White Sea Biological Station “Kartesh” (WSBS) of the Zoological Institute of Russian Academy of Sciences (Saint-Petersburg). Gametes were obtained by dissection. Oocytes were fertilized in vitro. Experimental embryos were recorded in seawater at 12 °C in a chamber with 300 μm plastic wells on its bottom. Axoclamp 2B amplifiers (Axon Instruments) and 2 M KCl-loaded glass microelectrodes with 20–40 MΩ resistance were used for recordings. Current/voltage signals were acquired and analyzed using DigiData 1200 series ADC and pCLAMP software (Molecular Devices, Sunnyvale, CA, USA). SigmaPlot 9.0 software (Systat Software, Inc., San Jose, CA, USA) and Microsoft Excel 2013 were used for statistical analysis. For dye injections one electrode was filled with 3% carboxyfluorescein (Sigma 21,877) in 0.2 M KCl. Negative current up to 12 nA (I2 electrode) was injected into single blastomeres of the 2-cell stage embryos (Fig. 1). In all experiments, one blastomere was ionophoretically injected by carboxyfluorescein dye through the V1 electrode. Injected embryos were visualized and photographed with an Olympus BX51 luminescent microscope and an Olympus XC10 digital camera. The filter set was optimized for fluorescein. According to Ohm’s Law the approximate value of GJ resistance Rgj was calculated by the equation based on the simple electrical circuit depicted in Fig. 1 with a reasonable assumption that the total membrane resistance does not change upon cleavage, blastomeres are identical and Ric ≈ 0.
where the A index is used, for incomplete cleaved zygote experiments while the B index for experiments with 2 blastomeres connected by gap junctions (Fig. 3d). Our updated search for connexins and innexins/pannexins in protein and nucleotide databases via BLAST and HMMER (http://hmmer.org/) confirmed an earlier observation [20, 21] that indicates no homologues of these proteins in cellular organisms outside Metazoa clade. 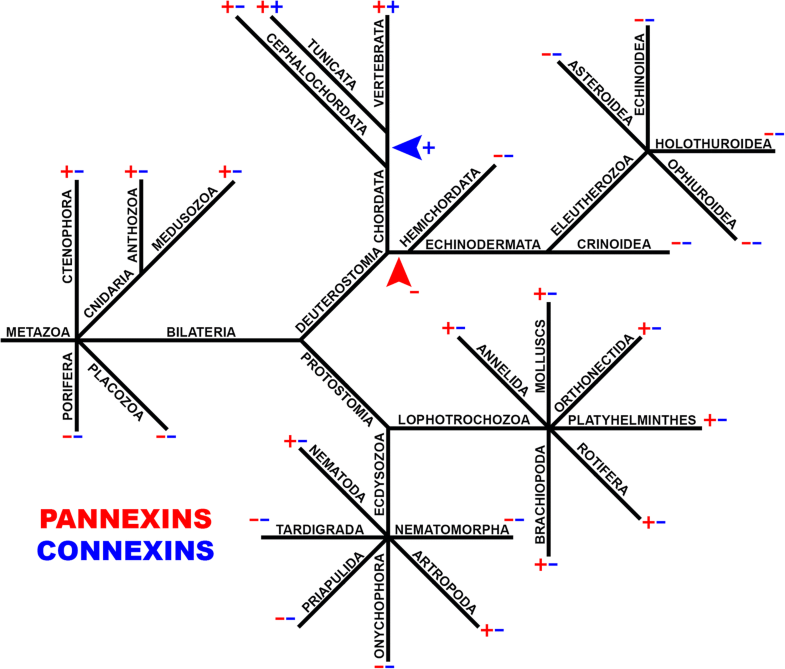 Figure 2 shows a simplified phylogenetic tree of metazoans, which points out connexin (blue) and pannexin (red) presence or absence in the main taxonomic groups. Research confirms that connexins are universal for craniata (vertebrates) and tunicates, whereas no connexins could be found in the basal cephalochordate (lancelets) branch of chordate evolution. This suggests a relatively late acquisition of the new GJ proteins (connexins) in the background of earlier pannexin presence. In basal metazoans, pannexins are present in Ctenophores and Cnidarians but were not found in Placozoa and Porifera. Species from two related groups of extremely simplified parasitic Cnidarians – Myxozoa and Polypodiozoa (Polypodium hydriforme) also appear to lack pannexins. Unexpectedly we were not able to detect pannexin homologues in several protostome Ecdysozoa phyla: Tardigrada (Hypsibius dujardini; Ramazzottius varieornatus) Nematomorpha (Paragordius varius), Onychophora (Euperipatoides rowelli) and Priapulida (Priapulus caudatus). Previously it was stated that both connexin and pannexin genes are absent in the sea urchin genome [9, 10, 20, 21, 25]. Genome sequencing analysis confirms this conclusion . Recently, several additional species from different Echinodermata orders (Crinozoa, Asterozoa, Echinozoa, Blastozoa, Crinoidea) were sequenced and added to NCBI database. Eleven available Echinodermata genomes (Ophiothrix spiculata, Apostichopus japonicus, Acanthaster planci, Eucidaris tribuloides, Lytechinus variegatus, Patiria miniata, Hemicentrotus pulcherrimus, Strongylocentrotus purpuratus, Ophionereis fasciata, Apostichopus parvimensis and Patiriella regularis) and one SRA experiment (Crinoidea, Antedon mediterranea) were investigated and we have found no connexin or pannexin homologues in this data (Table 1). GJ genes were also not found in Hemichordates (Ptychodera flava and Saccoglossus kowalevskii) another deuterostome phylum, generally considered the sister group of the echinoderms. The views on early metazoan evolution are controversial  and the observed GJ gene existence pattern could either indicate the basal absence of pannexins in Porifera, and their eventual loss in Placozoa or a simultaneous pannexin loss in both Placozoa and Porifera, if Ctenophores are more basal metazoans. Anyhow, the presence of pannexins in the base of the metazoan tree allows us to interpret pannexin absence in some bilaterians as a gene loss. The set of GJ proteins varies in different species with several loss and acquisition events. In extant species, GJ protein genes are present in multiple copies. For humans and model animals, it was shown that GJs are essential for organism fitness and survival, however evolutionary loss of such important genes is not clearly explained [28–31]. Phylogenomic trees show that pannexins from different big metazoan phyla are not intermixed in tree nodes and the generated tree satisfies commonly accepted metazoan taxonomy [32–34]. This observation indicates that only one precursor pannexin gene was acquired vertically from the common ancestor and then was then diversified independently in each animal phylum. The evolutionary loss of a single gene is more possible than the consequent loss of many genes from an important protein family. The reduction of the pannexin family can be associated with the competition versus newly acquired connexins. Similarly, the loss of pannexins might be simplified when another protein substitutes for them in GJ function. The existence of animals lacking both connexins and pannexins in their genomes challenges common views on intercellular channels. Unfortunately, there are almost no functional GJ studies on such species. Preferably, the presence of GJ type of intercellular channels has to be supported by direct electrophysiological cell coupling measurements. Together with intracellular tracer dye injections, it allows us to make a distinction between real GJ channels and incomplete cytoplasm separation or cell fusion (Fig. 1). These kinds of experiments require the use of relatively large cells which allows us to impale at least two microelectrodes or patch pipettes in adjacent cells. For instance, it is possible to take an advantage of big cells of the early embryo. Blastomeres are much bigger than developed cells allowing intercellular electrical coupling to be measured by conventional electrophysiological methods [35, 36]. In several invertebrate GJ studies, it was shown that carboxyfluorescein fluorescent dye did not diffuse between electrically coupled cells [9, 10, 37]. This dye is membrane-impermeant and can be easily ejected from glass microelectrodes electroforetically. Therefore, it was selected for our electrophysiological experiments on the early two blastomere development stage of common starfish Asterias rubens embryo. Two glass microelectrodes, one loaded with KCl and one filled with 3% carboxyfluorescein dissolved in KCl solution, were injected into two adjacent blastomeres right after presumed first zygote cleavage. To detect the electrical coupling short negative current pulses were applied through one electrode (Fig. 1b) while membrane potential changes were recorded by the other electrode. Voltage shift, measured by the second electrode indicates electrical coupling. 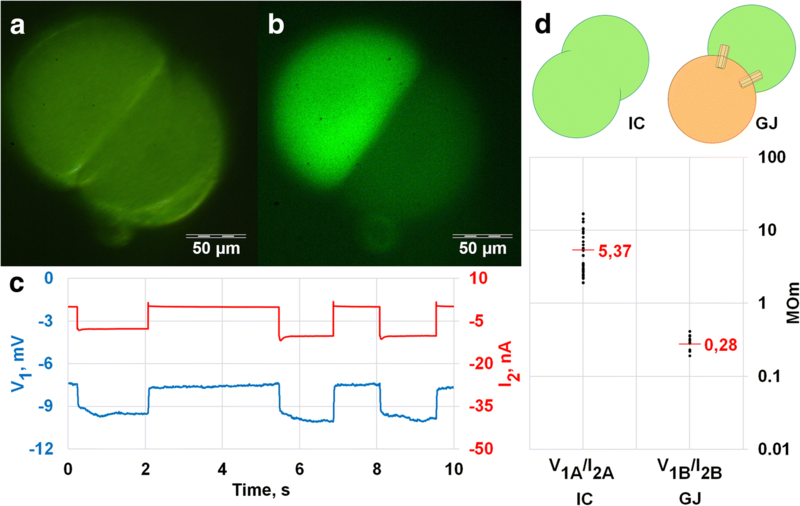 Voltage drop measured by the microelectrode placed in the space between fertilization membrane and cell membrane in response to current pulse into the intracellular electrode placed in cytoplasm was below detectable values. Fluorescent dye was injected from one electrode before electrical measurements to determine incomplete zygote cleavage. Electrical coupling between two electrodes was observed after cell membrane penetration in 14 A.rubens early embryos. In 10 experiments fluorescent dye ejected from one electrode evenly loaded the whole embryo of an apparently incompletely cleaved zygote. In 4 experiments fluorescent dye diffusion was confined to one blastomere (Fig. 3a, b). These separated cells were electrically coupled as shown in Fig. 3c. Figure 3d show V1/I2 values for two different situations. On the left (IC), V1/I2 is actually the membrane input resistance (R) of an incompletely cleaved zygote (inset on the top). On the right (GJ), we show the ratio of membrane voltage shift from blastomere 1 (V1) in response to a current pulse into a separate blastomere 2 to injected current pulse I2. Strict coupling coefficient or GJ resistance measurements between two cells require 3 or 4 electrodes with two electrodes (one for current and one for voltage) inserted in the same cell. Early starfish embryos are fragile and we were not able to use more than two electrodes without fatal cell damage. Yet with reasonable assumption listed in methods section we can estimate Rgj in the electrical circuit depicted in Fig. 1 as about 390 MΩ. Thus, we conclude that starfish embryonic cells are connected by channels permeable for ions, but with a pore size small enough, to block soluble carboxyfluorescein molecules from passing. Our data is consistent with the earlier publications that reported low electrical resistance cell junction presence in two echinoderm species [22–24]. Are there additional GJ proteins in Metazoa? Our comparative genomic studies suggest that some metazoans appear to have neither connexins nor pannexins. This implies that, either some multicellular animals have no gap junctions, or an additional family(s) of GJ proteins may exist. Already published reports [22–24] and our new physiological data shows the presence of functional GJs in Echinoderms. New type(s) of intercellular channels might be present in parallel to pannexin and connexin based gap junctions in several animal groups, other than Echinodermata. Some evidence in support of this hypothesis could be found in nematode studies. In a recent high-resolution expression study of all members of the pannexin (innexin) protein family in Caenorhabditis elegans, no detectable pannexin expression was found in some cells with well documented gap junctions [38–40]. Twenty years ago, the existence of gap junction proteins other than connexins had not been merely unknown, but entirely unpredicted and unsuspected. Then the OPUS-innexin-pannexin family entered the stage. Although, previously we ourselves named pannexins, in opposite to Chordate-specific connexins, considering them as the universal metazoan GJ proteins, now we admit a possible future discovery of additional protein families utilized for GJ function. This work was supported by Russian Science Foundation grant 17–15-01433. Publication costs are funded by Russian Science Foundation grant 17–15-01433. Y.V.P. conceived and designed the manuscript, and all authors contributed significantly to the writing and the creation of the Figs. G.A.S.-K. worked with starfishes. G.A.S.-K. analyzed genomes. V.P.K. and G.A.S.-K. made experiments with dyes V.P.K. and Y.V.P. conducted electrophysiological experiments. V.P.K. carried out calculations of resistance. V.P.K. and Y.V.P. conducted electrophysiological experiments. V.P.K. estimated model. All authors read and approved the manuscript.